1978 Softball team. 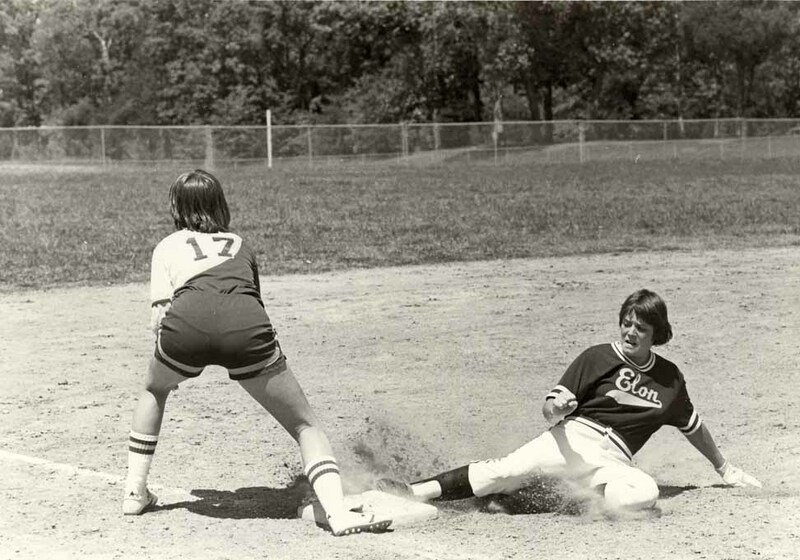 Jackie Myers '78 pictured sliding to base. The ping of an aluminum bat, the soft thud of the catcher receiving a pitcher’s fastball, the cheers of encouragement from teammates and fellow students. Hearing these sounds on a cool, spring afternoon next to a well manicured patch of grass can only mean one thing: the Elon softball team is back in full swing. While today it may seem like a timeless springtime tradition, what is unique about the 2012 season is that it marks the 35th year that Elon softball has participated in intercollegiate play. A brief glimpse into the program’s beginnings reveals the rich tradition it has had since its inception. Starting in the 1970’s, Elon began a concentrated effort on the expansion of the school’s athletics program, with a specific focus on the establishment of women’s sports. Starting with the organization of the women’s basketball and volleyball teams in 1972, the increased participation of female athletes at Elon paved the way for future growth of women’s athletics on campus. Softball, the third intercollegiate sport offered for women at Elon, was organized in the spring of 1977 by Assistant Professor of Physical Education, Mary Jackson. Modifying Elon’s already established athletic nickname, the “Maroon and Gold”, the women became known as the “Golden Girls” and started the new softball program off with a bang. Jackson led the Elon softball team to a 12-5 finish in their inaugural season, and won the 1978 North Carolina Association of Intercollegiate Athletics for Women (NCAIAW) State Softball Championship in just their second year with a record of 19-9. The start of the 1980s saw the Golden Girls continue their regional dominance, winning back-to-back conference championships in 1980 and 1981 with records of 25-7 and 30-10 respectively. The 2012 team continues to build upon the success of the very first softball team at Elon, playing home and away games against elite competition from across the nation. While the individual names may have changed with the start of each new season, what can always be expected is a high level of play and a competitive spirit that is fun to watch game in and game out.